I had a very exciting 4th of July weekend. My older sister came down for a visit and Saturday, we all went to her in-law’s house to watch the fireworks display while sitting on a lawn chair on the sidewalk. How awesome is that? They had great food and HOMEMADE ice cream (two flavors… chocolate or raspberry). I was in ice cream heaven for a little while. Yum! While we waited for the Fort Worth firework show to start, the kids lit the sparklers and my niece (who’s 5 years old) had a hay day with the snaps that you throw on the ground and they pop like a fire cracker. K was so funny. Every time she threw one near him, he acted all scared and jumped and screeched. Oh the joys from the laughter she makes. Even though I had a LOT of fun, the fireworks smoke and the humidity became too much for me. I had to go inside after the show was over. When I got home, I was feeling it badly. Sunday, I got up to see off my sister & her family and after that.. it was a blur… We crashed for about 4 hours. A five year old can really wear you out!! Sheesh! 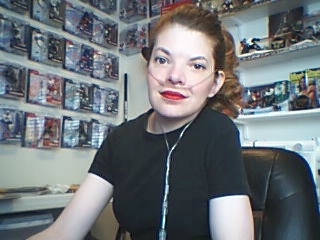 Once again, Miss C, told me that she still has the little canula tubing that I gave her when she was about 2 years old. So sweet and precious. I’ve been pretty busy lately with gardening, crocheting, and working on a new adventurous project involving my rubber chicken, Klondike. Maybe you’ve heard? You can read about it here. So, I’ve been getting him prepared to leave and head to my sister’s house so that he may continue on to PARIS, FRANCE!!! I’m gathering things that he might need for the trip…. He’s getting really excited and I don’t blame him one bit. *wink* I just think that this is such a sweet thing my sister is doing for me. Here’s what I have so far! 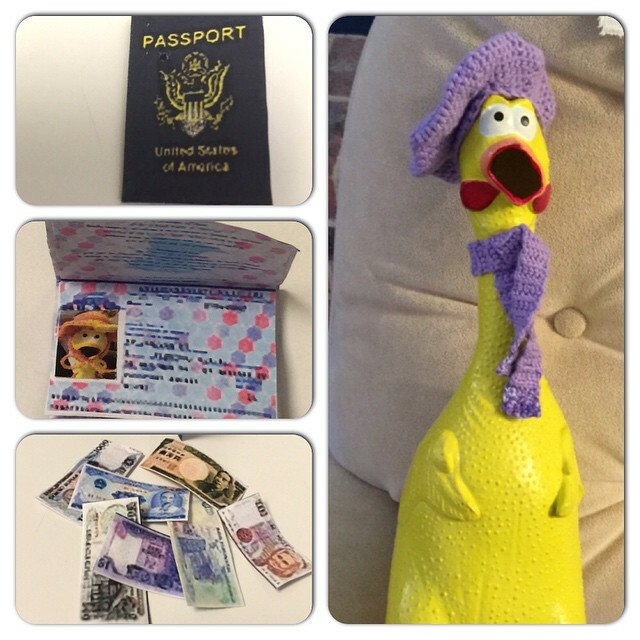 Passport with Klondike’s picture, Mad Money, a Beret and matching scarf. I’m also having some gardening luck this year. I actually have 3 whole lemons growing! 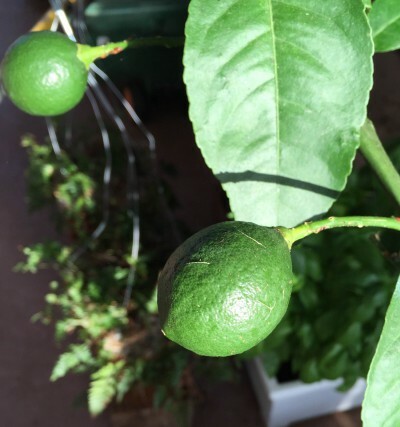 *shocker* It’s the first year since I’ve had the Meyer Lemon dwarf tree that it’s produced fruit. Hey, maybe they will be edible! One could only hope. Next is my raised flower bed that I got for last Christmas. 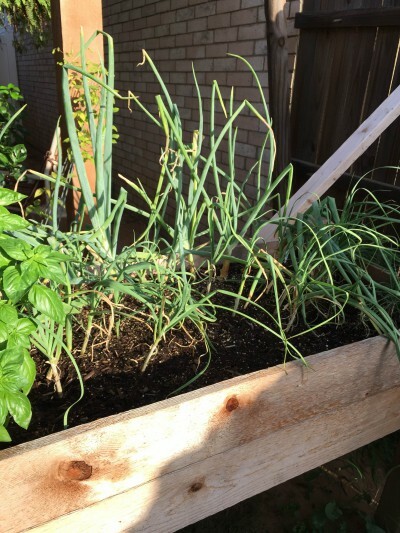 My spinach didn’t make it… bummer… but my yellow onions, garlic, chives & basil all are growing well. It’s my first time growing onions and garlic. I hope they survive because I’m really getting into fresh food. I can’t believe how much tastier a recipe is with fresh garlic. I mean, wow! hehe! The other thing I’ve been working super hard on is sending out Need a Hug afghans. I love doing this. If you need a hug and have trouble breathing, you email me! goredrider@gmail.com It’s free thanks to some really wonderful and generous donors. 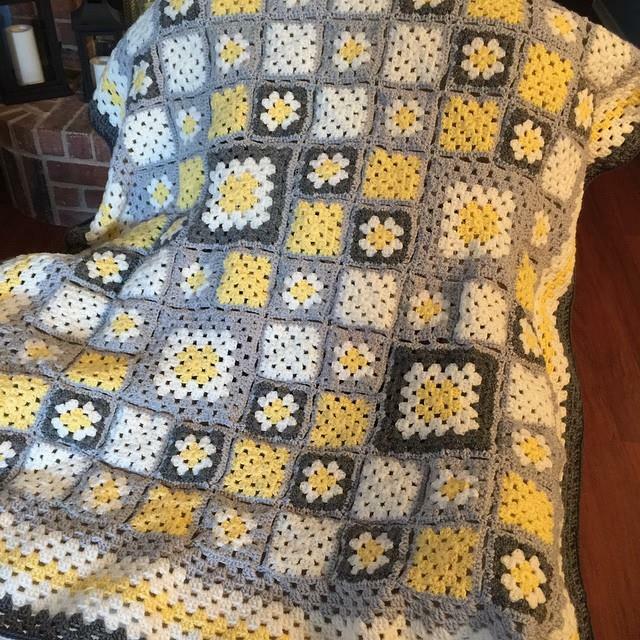 Here’s the afghan that I just sent out last week. My current afghan that I’m working on is going to Illinois! I hope everyone is doing well this Summer. *HUGE HUGS* I love hearing from you. Be well! Sign up to follow my blog so you won’t miss any of the exciting things I write… even Klondike’s adventure! YAY!